The wind died overnight and we awoke to a pearler day. Dressed lightly, we skied and cycled on a perfect surface, gliding past one mountain after another. The highest in the surrounding ranges is Faure Peak at 3,947m – a snowy behemoth of alpine proportions. But glaciers rule here – they give birth to the mountains, they sculpt them, they grind them, then turn them to rubble. We've covered half the climb to the South Pole. Over the next three days we climb another 500m then the last 800m+ over the last 350km. We've come 171km (20 today), and have 441 to go as the snow petrel flies. Up ahead (27km) we have a crevasse field spanning the width of the glacier. Radar imaging showed it to be relatively benign straight through the middle – but I will be relieved once we are through it. 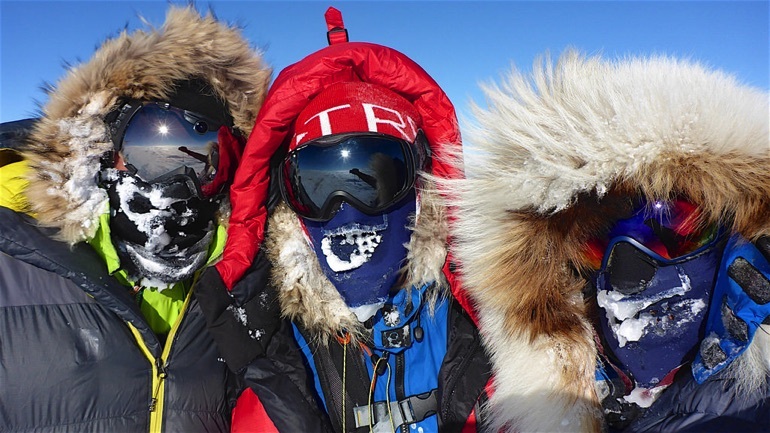 Lunch was a laugh fest in the warm sun but the afternoon was a little taste of the plateau – a biting wind in the face had us dressed warmly with full head gear. A nice teaser. I'll scream it again. Aaaaargh! I pegged this trip as one that would be, other than ourselves and our comms, completely void of human evidence – tracks, planes, flight trails, satellites, waste, anything to indicate other human existence. But no. We passed two empty and weathered fuel drums, a legacy likely from the aerial survey work of the 1960s. I am so bummed. Seems I may need to wait until next year for a pristine trip to the South Pole! Mixed bag today – wind, cloud, sun, still, ice, snow, crevasses, sastrugi, warm, cold, fast, slow. We're now camped at the southern margin of the mountains. After that we do a little dogleg then head due south. The next couple of days herald what I see as the crux of the glacier. Our crux day was one of our best. It could have gone either way but everything panned out better than expected. In the morning, we climbed steadily on a perfect white ice surface with just enough grip for ski skins and rubber tyres. 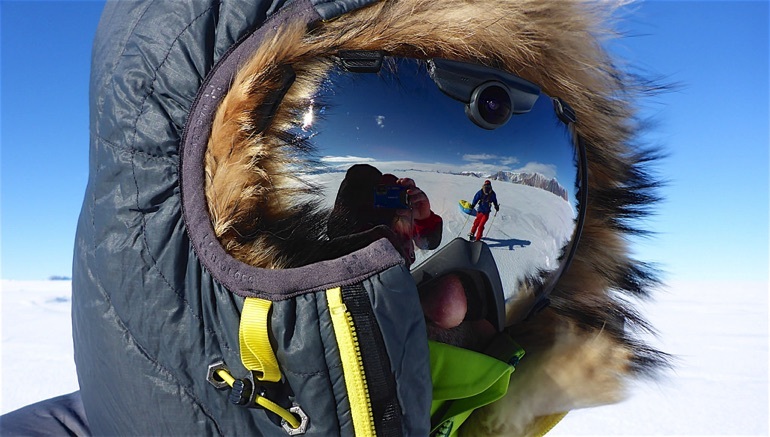 A wind in the face kept us honest and we watched the glacier morph through our goggles. Heavy crevassing seen around the bluff foretold of what lay ahead, the ice buckling and heaving as it makes first contact with the mountains. 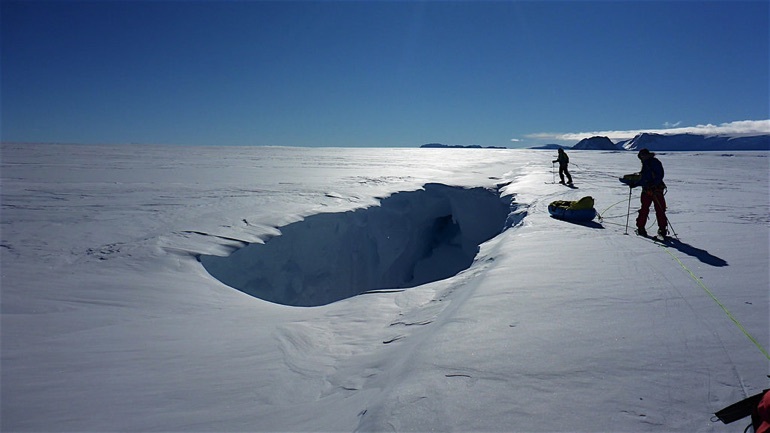 Despite our distance from the bluff, we reached our first big crevasses at lunch, 40m wide, and roped up, Keith on skis with his bike strapped to the sled. The widest we crossed was 60m and had our strung-out trio on the crevasse at the same time. But a solid bridge covered in small sastrugi gave me assurance. Later we found collapsed bridges, always in highly slumped areas. We covered our mandatory 20km but didn't clamber into our tent til 8pm. Reedy is all but done. At day's end tomorrow – above 2,000m elevation – we will have considered ourselves pioneers of the Reedy Glacier. Despite camping in a crevasse field we consider ourselves on the edge of the polar plateau with the Reedy Glacier behind us. It's a pretty wonderful feeling to have done something no one has done before, taking the path never travelled. It's my second new route to the pole and will be my fourth different route to the pole, assuming we get there. 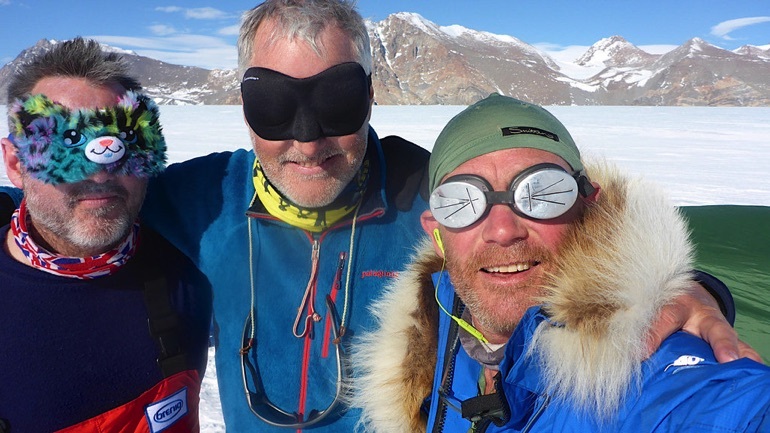 For Rob and Keith it's a magnificent achievement for their first South Pole expedition. Not only are they explorers but also wonderful companions. With the mountains receding behind us we climbed slowly and steadily due south for the first time – our tally travelled equal to that subtracted from our remaining distance. After lunch a bitter wind swept in from the SE and, together with the drift snow it carries, batters the tent as I write. We fell short of our 20km – I stopped us early, not wanting to commit to a spur up ahead that's likely icy on top, as was the last. We need snow for securing the tent and melting for water. Keith skied the last hour due to crevasse concerns. 18.3km today. Total 229 with 386km to go. -18c. The wild wind from the southeast persisted all night and day making for challenging travel. We skied the first hour to exit the crevasse field and then Keith tried riding but was constantly stymied by soft skis, sastrugi, the wind and a big hill. He resorted to pushing much of the way. For Rob it was a watershed day. He put into practice the various tips on skiing he'd been given over the last two weeks and spent the entire day honing his technique, the result being a faster, happier and more stylish skier. We had only two breaks today, it being too cold and windy to stop more often. By days end we'd covered another 20km, dressed in full headgear. But we lost around .5km due to erring too much to the east. Tomorrow better. Seems like a full blizz brewing outside! Dammit. Brutal day with wind, bad vis and sastrugi. Low on power due to no sun, so sms via sat phone. We've been low on power the last three days with heavy cloud over us. We have only one solar panel between us so we share it throughout the day to power our devices. Today we covered 20km in difficult sastrugi. It's not particularly big but its relentless – the most expansive sastrugi I've seen and all running perpendicular to our route. Today the hull of my sled cracked open like a Kinder Surprise. It's a lightweight sled I used for the North Pole in April and it must have sustained some micro damage that I didn't detect, resulting in a metre-long crack extending back from the bow. I just spent two hours trying to patch it up – we'll see how it holds up. Looks very Frankinsteinesque. Blue sky returned to our happy camp last night and we used it to good effect today, weaving a convoluted path through the sastrugi, which hasn't abated an iota. 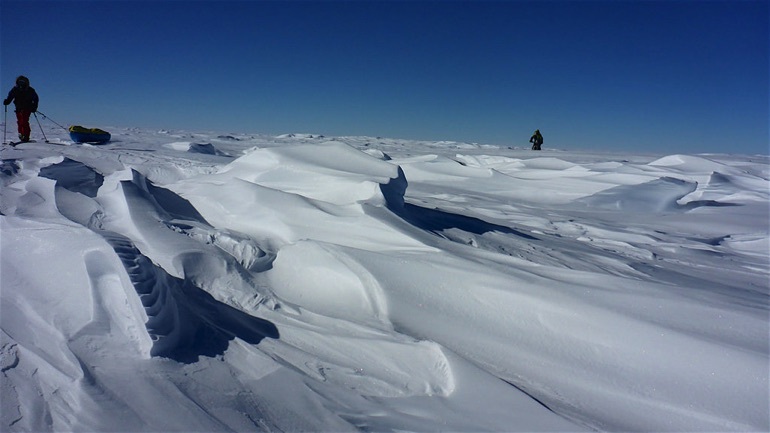 For the uninitiated, sastrugi – a Russian word – are wind-formed ridges of hardened snow, and are very common in Antarctica. They can grow to 2m in height – ours are around 60-100cm. If they are aligned to your direction of travel then passage is relatively straightforward; if anything but aligned they are a complex maze to navigate. 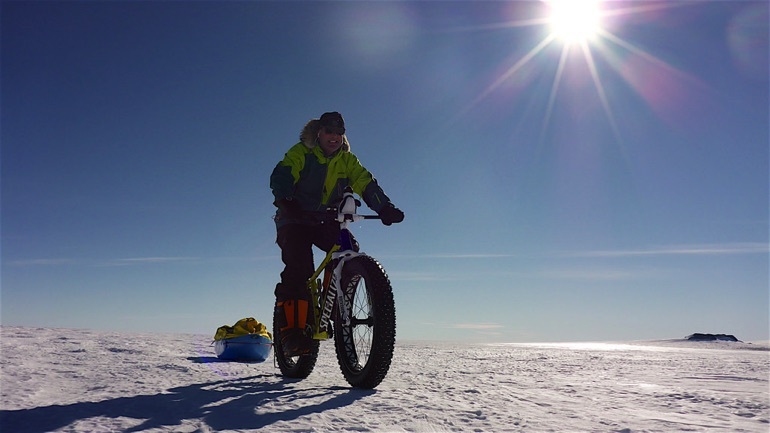 Today marks half way to the pole, around 300km to go. We did 22km in 8.5 hours and are now cosied up in our tent making Xmas calls. We are just east of the date line so our Xmas will be tomorrow. My sled sustained another crack today, which I repaired. 300km of sastrugi will be too much to ask of it. Tentbound all day after a blizzard came in overnight. Boring. But a good chance to tweak some bits of gear and rest. No images until we get some sun to charge devices. This post comes via my Yellowbrick tracker, which has short message capability but is not able to transmit images. Hoping for good fortune tomorrow but it's not sounding good – the tent is being battered by wind and spindrift. I need my game of Pass the Pigs! We were tent bound today due to a blizzard. Below is my post from yesterday before heavy cloud blocked the satellite modem signal. A strong wind from the south east together with heavy sastrugi and a low dark sky made life pretty tough today. Stopped at 7.15pm and couldn't get our tent up fast enough. Keith had his first full day off the bike. 20km in 9 hours of skiing. Ouch! Low on power due to an absconded sun so keeping this blog short. 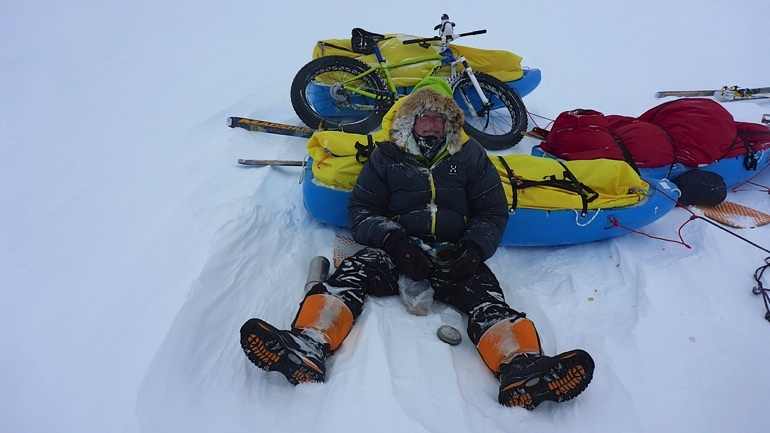 Eric Philips OAM has been exploring the Earth's fragile polar regions since 1992. He is author of Icetrek. The Bitter Journey to the South Pole and his expeditions have produced four internationally-screened documentary films, including the Emmy Award-winning Greenland production Chasing the Midnight Sun. 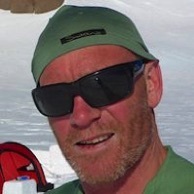 He is founder and Director of Icetrek Expeditions and Equipment, and is President of the International Polar Guides Association. Eric lives in Hobart, Australia.